The amazing growth of sharing apps promises to mark the spring of 2014 as the beginning of a new era demonstrating the power of the swarm. Just as the summer of 1998 marked the beginning of the mainstream Dot Com era and the spring of 2008 saw the advent of global social media, the April IPO of Opower marks a new digital-physical era, the collaborative economy. The collaborative economy will make cities more convenient, less costly and more sustainable. To provide a mental model of this new world, think of cities as hives for “swarms” of physical activities optimized by, or made possible through open urban data schemes. Earlier this month, I presented this concept in Vienna (ranked as one of Europe’s top smart cities) at IconVienna, a Central European investment forum on smart cities and innovation. Cities are similar to beehives as they provide the physical locations for the activities of the swarms they host. Of course, both cities and hives need to be in the right place to attract and maintain the largest, healthiest swarms. For beehives, it doesn’t hurt to have access to sunlight, water and flowers. (Admission: I’m an urban beekeeper) Swarms of bees, if they are wild, decide on locating in a hive according to consensus (15 bees must approve of the location) and then they develop optimal social structures according to simple rules and communications. Cities or metros set laws, regulations and policies at the level of the hive. But emerging swarms, based on digital maps of locations and characteristics of “flowers,” optimize according to physical needs, desires and energy. When bees find flowers, they go back to their hive and dance to show the location of pollen-laden flowers. Imagine if bees could compare with other nearby swarms how much energy they were using (as Opower enables its users to do), how much other swarms were gathering and the quality of their haul. Or if Airbnb offered swarms an easy way to find convenient unused hives, saving much energy and reducing greenhouse gases in the process. More and more we humans are using rich digital maps and pricing information for sharing rental rooms, office space, cars, bikes, food, and energy use. Our pollen dance will be our testimonials, use patterns, geo-location, and referrals. Some swarms will get smaller or even die off, while other swarms will grow until they divide and form new swarms based on emerging needs and changing conditions. Open data will reduce urban traffic congestion: no longer must cars circle downtown blocks as real-time parking rates and open spaces become transparent. Even more sustainable are those who are deciding to telecommute or use public transit on days when they know that parking costs are spiking or when spaces are unavailable. Likewise mobility and housing availability will be based on shared uses through sharing and peer-to-peer platforms such as ZipCar, Lyft, Uber, and Airbnb. Walkability data through Walkscore already allows people to analyze and select the most walking-friendly housing, jobs and vacations, so they don’t even have to depend (or spend!) on cars or transit. At a TEDx Mission a while back, I showed how hacktavists use open data from the Paris Velib bikeshare program to map bicycle availability in real time. For energy use, besides Opower, companies such as C3 Energy and Stem provide Big Data energy analytics for businesses and industries, so they can reduce energy consumption through more intelligent use of utilities. These applications differ from sharing platforms, but still rely on bottom-up use strategies based at the level of digitized electrons—with energy being the last realm of digitization in our society, after communications, entertainment, and financial or healthcare services. In Vienna, the hive and swarm concept I presented was met with excitement. European Union contingents of investors are planning trips to explore San Francisco Bay Area sharing economy start-ups as a result. The European Union is spending $92 million Euros on an ambitious smart city funding and strategy effort as part of its Horizon 2020 program, yet I was told that swarm-type user-centric applications have been largely overlooked so far. That omission is not surprising, as even in the US, cities such as Los Angeles are only now preparing to open up their data. Hives (cities) must offer not only the best amenities, such as high quality of life, transit on demand and walkability, but they also must reduce restrictive policies favoring business as usual in order to enable massive, easy and open access to city data. The swarms are coming: if you’re a city leader, you can block them or anger them. 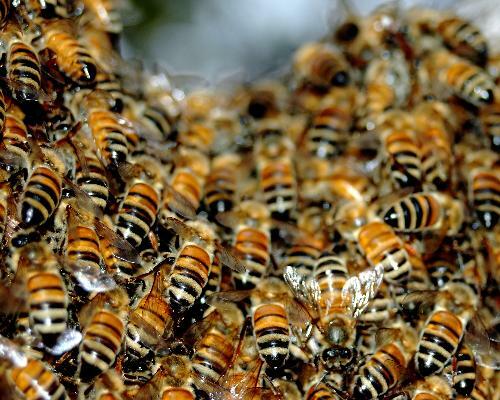 Or you can accommodate the swarms and share in the eco-efficiency and abundant honey they make when they prosper. The US National Climate Assessment, a new draft study by 13 federal agencies under the Dept. of Commerce, warns that climate change is introducing to cities ample societal and business risks, but also economic opportunities. Because extreme weather is expected to increase, our changing climate is our future, especially in urban areas, where 80% of the nation lives. The unprecedented 1000+ page draft report–the most ambitious scientific exercise ever undertaken to catalog the real-time effects of climate change, and predict possible future outcomes–came out Friday from top federal research agencies, state agencies, private industry and university experts. Today the report became available for public comment. As new investments in energy technologies occur, future energy systems will differ from today’s in uncertain ways–depending on the changes in the energy mix. This portends unprecedented opportunity, so look for some of the largest industry sector changes and resultant new business models in utilities and energy. Distributed systems of all types will proliferate: renewable energy; wastewater, water and waste reuse. These technologies in many cases will provide better alternatives to large-scale centralized energy generation or water treatment systems and their outdated regional transmission networks, which are at risk to coastal flooding, severe storm outages, wildfires, and critical drought. Smaller localized or regional power outages lasting for weeks all the way up to the large historic Northeast US power outages (2003: 55 million impacted in US and Canada) are prime examples of events that could regularly occur as a result of such threats. Smart grids and energy systems incorporating system redundancy. The Netherlands grid provides an example of a circular grid (versus hub and spoke) that is almost completely ensconced safely underground. In order to reduce future risks and to cope with already occurring events, comprehensive urban climate planning, management and technology approaches are needed to implement massive upgrades to vulnerable infrastructure. Extreme weather events are already affecting energy, and energy delivery facilities. Consider the regional gasoline shortages that occurred after hurricanes Katrina, Rita, Gustav and Ike because there was (and is) only a single pipeline from impacted areas to markets in the Southeast. Cities and smaller communities are more risk adverse to climate change impacts (or other natural disasters) with alternatives to private cars such as public transit, walkability and cycling infrastructure. Policy makers, the private sector and academia will need to jointly collaborate to better “understand the relationship between climate change, energy development, and water- dependent socioeconomic sectors to inform national and state-level energy policies.” These sweeping new policies are likely to include everything from watersheds and aquifers to land development and other agreements for metro and city general plans and utility districts. The bottom line is that global climate is apparent across a wide range of US geographies and sectors. Global human-caused climate change is projected to continue to occur over this century and beyond. The magnitude of climate change beyond the next few decades depends on our actions now, combined with how sensitive the climate is to increased carbon emissions. U.S. average temperature has increased by about 1.5°F since record keeping began in 1895; more than 80% of this increase has occurred since 1980. The most recent decade was the nation’s warmest on record. U.S. temperatures are expected to continue to rise. Heavy downpours are increasing in most regions of the U.S. Further increases in the frequency and intensity of extreme precipitation events are projected for most U.S. areas. Certain types of extreme weather events in some regions have become more frequent and intense, including heat waves, floods, and droughts. The increased intensity of heat waves has been most prevalent in the West, while the intensity of flooding events has been more prevalent over the East. Droughts in the Southwest and heat waves everywhere are projected to become more intense in the future. There has been an increase in the overall strength of hurricanes and in the number of strong hurricanes in the North Atlantic since the early 1980s. Strongest hurricane (Category 4 and 5) intensities are projected to continue to increase as the oceans continue to warm. Winter storms will increase. Other severe storms, including the numbers of hurricanes and the intensity and frequency of tornadoes, hail, and damaging thunderstorm winds are uncertain and are being studied intensively. Rising temperatures are reducing ice volume and extent on land, lakes, and sea. This loss of ice is expected to continue. The oceans are currently absorbing about a quarter of the carbon dioxide emitted to the atmosphere annually and are becoming more acidic as a result, leading to concerns about potential impacts on marine ecosystems. The length of the frost-free season (and the corresponding growing season) has been increasing nationally since the 1980s. The largest increases have occurred in the Western U.S., affecting snow-pack water supplies and related ecosystems and agriculture. The National Climate Assessment findings mean that public policies will be of little value that are solely based on either past business or operating models, past (or even existing) resource or energy prices, as well as so-called “100-year” flood models. This is a new game and we can’t play by the same old rules with the same teams. But we now have, for the first time, the parameters of the playing field–the geography of observed and projected impacts. The fields of industry, economics and timescales are less defined. Adapting to the climate and climate-impacted economy of the future that we are just beginning to experience will require the emerging collective intelligence of our society through the use of collaborative technologies including social networks, which was the subject of a San Francisco TEDx talk I gave last year. We will need to leverage our institutions, particularly our educational system, while building upon the body of global knowledge that shows that if we act now, we can successfully avert the worst impacts of climate change that are daily becoming evident in the United States and throughout the world. Warren Karlenzig is president of Common Current, a global consultancy based in the San Francisco Bay Area. living downwind (the West Coast of the US and Canada), concerns are multiplied. will become the next concern for survival even before the radiation leaks subside. impacting global trade at least for the year. other material) as well as lifecycle radiation risks. that to its older nuclear plants. The EU is stress testing more than 100 of its nuclear plants, according to the American Public Media show Marketplace. also hosts its version of Hurricane Alley in its Pearl River Delta region. sea water intrusion into drinking water supplies and fresh water ecosystems. About 1.6 million households in Japan were without water as of 3/18. energy require only local transmission lines, which can be repaired quickly. perfected, let alone invented. Electricity supply is spotty from Tokyo north. Tokyo faces six months of brownouts, or reduced power because of the nuclear crisis (nuclear provides the nation with 30% of its total electric power). Skype, Vonage, etc. work in Japan, too. banned and, more disturbingly, operators may have been forced by events to abandon nuclear plant control rooms.